When I was growing up my mother and grandmother were both very adamant that when you get a letter or a gift you always send a thank you note. I’m trying to pass this message on to my daughter also, even if she’s just emailing her grandparents to thank them for something. In this age of fast-fast-internet-everything I was really blown away to get this package in the post from Diptyque @ Westbourne Grove yesterday. 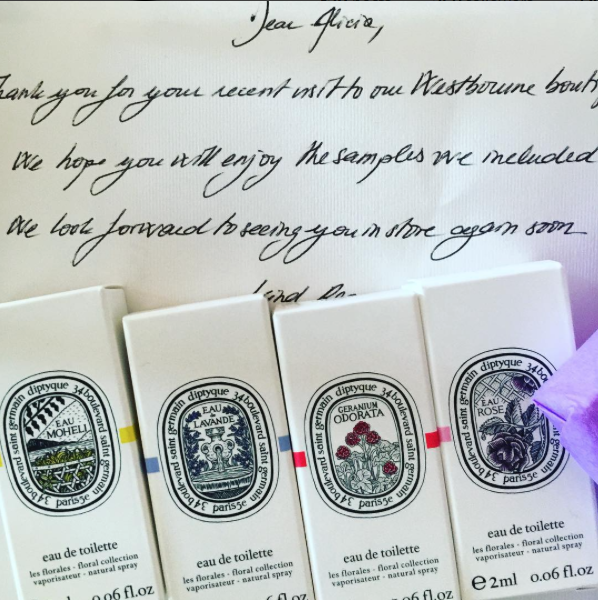 Not only did I receive four free samples which smell amazing, but they took the time to write me a hand-written note to tell me about it.